Rend the heaves and come down! Does it matter if the Islamic State is 'self-declared'? Writing yesterday about the visit of His Holiness Pope Francis to Turkey, John L. Allen, Jr. described the Islamic State as "self-declared", putting the phrase in quotation marks. Allen is neither the first nor the only American - or Western - journalist to describe the Islamic State in this way. Whenever journalists use this phrase - or one similar to it - in regard to the Islamic State is used in an attempt to de-legitamize the new Islamic government in a growing portion of Iraq and Syria. If the Islamic State is "self-declared," it is illegitimate, so the thinking goes, and is not an actual government but simply a militant group. Such a use of the phrase "self-declared" ignores an important reality: the United States of America was itself "self-declared" with the issuance of the Declaration of Independence. 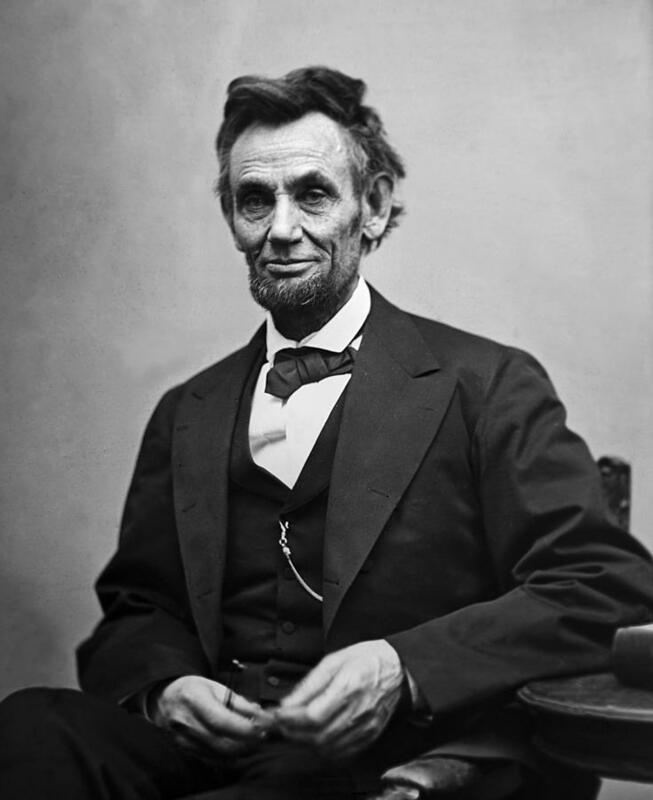 Self-declaration, then, does not, in and of itself, de-legitamize a government; no one would say that the government of the United Sates of America is illegitimate because it was "self-declared". What is more, any group that issues its own currency is much more than a "militant group"; it is a government - whether we like it or not - and it is time the world began to realize this. Turtles in stone. They should be spewing forth water. When he said, “From foreigners,” Jesus said to him, “Then the subjects are exempt. But that we may not offend them, go to the sea, drop in a hook, and take the first fish that comes up. Open its mouth and you will find a coin worth twice the temple tax. Give that to them for me and for you”(Matthew 17:24-27). It's not a bad trick if you can do it. A man fishing at the Loch Raven Reservoir in north Baltimore County some two decades ago was convinced he had snagged a big fish after his line hooked something substantial. After reeling in his haul, the angler had no fish. He had, however, caught something even more remarkable: a large Gothic monstrance used by Catholics to hold the Eucharist for worship. You never know what you'll find when you go fishing. Capello tip to Deacon Greg at The Deacon's Bench. ir in north Baltimore County some two decades ago was convinced he had snagged a big fish after his line hooked something substantial. Despite the celebration of Thanksgiving Day being something the Italians do not quite understand (which is rather curious considering their love of family and of food), the staff of the Casa Santa Maria do an excellent job at preparing a traditional meal for us here. One meal began with an antipasto platter of a few kinds of Italian cured hams and small balls of mozzarella. Everything was very tasty and, while I missed Hawaiian sweet rolls and cornbread casserole, was very satisfying. A traditional style meal helps ease some of the longings for home this day, but I still miss my family and friends back home more so today than I normally be. The Sign of the Cross is one of the precious sacramentals abandoned by many of the Protestant reformers and one of the great and powerful treasures of the Catholic faith. Because of this, many Protestants do not understand why we Catholics value this simply but profound gesture and we need to have a ready explanation, both accurate and personal. In a previous post, I explained why we make the Sign of the Cross from left to right. In all our travels and movements in all our coming in and going out, in putting of our shoes, at the bath, at the table, in lighting our candles, in lying down, in sitting down, whatever employment occupy us, we [Christians] mark our foreheads with the sign [of the cross]." On a related note, many Protestants do not agree with the ancient use of crucifixes, of crosses with the image of the Crucified Lord, even though they are very Biblical in nature. 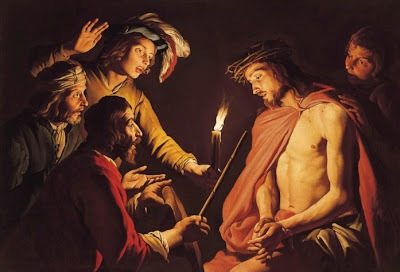 Saint Paul wrote that "we proclaim Christ crucified" (I Corinthians 1:23) and that he "resolved to nothing while I was with you but Jesus Christ, and him crucified" (I Corinthians 2:2). 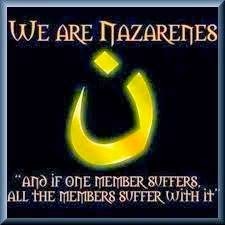 Islamic State bans contraception, yet there is no outcry against the "war on women"
Those who hate the Church because she teaches the truth often claim - against all evidence and practice - that the Catholic Church seeks to ban contraception and ensure that no woman has access to it. We heard this not too long ago in the aftermath of the HHS mandate. Certainly the Church wishes artificial contraception did not exist and that men and women did not use it because of the harm it does both to their bodies and to their souls, but she also recognizes and honors the free will of individuals. Nevertheless, this doesn't stop certain politicians and others from continuing to claim the Church desires to ban contraception (when all she has said is that she cannot be forced to provide it or pay for it). Then the fighters moved to abolish family-planning programs and halted the distribution of contraceptives, which had been available to married couples. When did this happen? In January. Where did this happen? in Mosul, Iraq. The Catholic Church's opposition to artificial contraception, which is rooted in the natural law and the truth and dignity of the human person, is often touted as part of the "war on women." Let us presume, for a moment, that this claim is true. Presuming it is, why have we not heard an outcry against the Islamic State from these same people? Their voices have been silent on this issue about which they claim to be care about passionately. Why? This is yet another piece of evidence that their real concern is not what they claim to be the war on women; their real concern is about hindering the activity of the Church and ultimately removing the Church entirely from the public square. Yesterday afternoon, after spending some time keeping up with the unfolding riots in Ferguson and across the United States of America, I visited the church of Saint Louis (in Italian, San Luigi) here in Rome to ask the saintly king to intercede for the people of his city and Archdiocese, that peace and reason will prevail and the senseless and barbaric destruction will end. I brought with me a simple Prayer Service in Devotion to Saint Louis provided by the Archdiocese of St. Louis which is perfectly suitable for private use and for use in small groups, classes, and families. It was in this chapel (or just outside it, really) that I prayed for the intercession of his holy king. please bless us who look to you for guidance. Help us to be kind to each other and to the poor as you were. a young boy who became a great king. so that we can be with you and Jesus in heaven someday. Saint Louis, pray for us! My next pastoral letter, on "Building a Culture of Growth in the Church," will outline a vision and a strategy for the Church to grow qualitatively by deepening the faith of individuals and the commitment of the community, and quantitatively by increasing the number of active practicing Catholics. 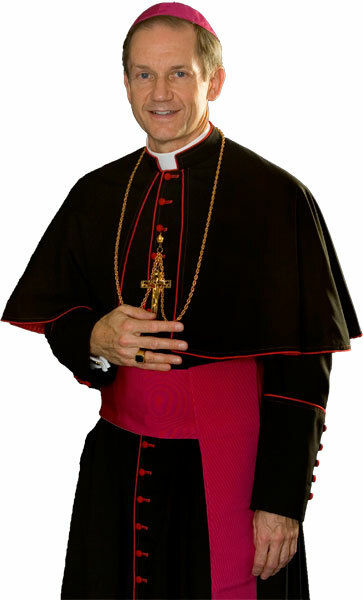 Bishop Paprocki's first pastoral letter, "Ars Celebrandi et Adorandi," addressed "On the Art of Celebrating the Eucharistic Liturgy Properly and Adoring the Lord in the Eucharist Devoutly." Shortly after he arrived in Springfield, Bishop Paprocki noted a decrease in overall Mass attendance in the Diocese of Springfield in Illinois over the previous 15 years of 30%. He commissioned the two surveys to find out why Catholics stopped attending Mass and to find out why others continued in the regular practice of their faith. I note that the 2013 October Count indicated a 1.5 percent increase in Mass attendance, marking the first increase since 2000! While that may seem small, it is significant in that it breaks a negative trend. In the past four years, we have also doubled the number of seminarians studying to become priests for our diocese! So I am encouraged by these hopeful signs that, with the help of God’s grace, we can rebuild and renew a community of dedicated and intentional disciples of Jesus Christ, always grateful for God’s gifts as faithful stewards of His beautiful creation! Though the Bishop did not indicate when he will publish "Building a Culture of Growth in the Church," I am already looking forward to it. I have previously written a few thoughts concerning of the results of Joy and Grievance in an American Diocese, which I will continue to do in the weeks ahead. While I admit there is some beauty to black and white photographs, I do not really understand the current fascination with them. Still, since I know people enjoy them, would you like me to post photos like these to the blog on a regular basis? which alone ensures true and lasting peace. so that we may all truly deserve to be called your children. Dot you want your crown? Don't forget the banner! Behold that Christ, the king of kings (cf. Revelation 19:16), established by decree that no one can see him, unless the person is crucified with him; and this decree is so general that no one is excluded; it is so necessary, that no one is dispensed from it; but each person is held to accept the cross of mortification in one's body so that the life of Jesus Christ may be manifested in one's body (cf. II Corinthians 4:10) through imitation; in other words, no one is worthy to follow him to the crown without the victory banner. Last week I suggested that Peter Jackson and company have saved the best song accompanying the closing credits to his movies for last with Billy Boyd's "The Last Goodbye." As the winter months fast approach there generally is little discussion about proper attire to be worn while attending the celebration of the Holy Mass, but a recent story concerning the upcoming visit of the Duke and Duchess of Cambridge to New York gives us reason to consider this topic again. "Why should the United States' press corps — who barely bother to brush the muffin crumbs off their polo shirts before lobbing questions at the President of the United States — schlep extra pieces of clothing to work just so they can make small talk with a (perfectly nice-seeming) British air ambulance pilot-in-training and a former chain-store accessories buyer?" asked New York magazine. Politico, a site covering Washington politics, noted: "Our much more refined brothers across the pond are apparently worried that the American press corps, with our pride of the haggard and ill-dressed journalists, won’t be appropriately attired when interacting with the royals"[more]. Frankly, if that is really how the press core greets the President of the United States, it may be past time for the White House to issue similar protocols. Leaving aside the question of what one wears in the presence of a President or of a Duke or Duchess, it ought to be obvious that we should dress at least as well when going into the presence of the King of the Universe (whose solemnity we celebrate this weekend). I've said it before, but it bears saying again: When considering what to wear to Mass, we ought not to wear what we might also wear to bed or to the beach (which, for most of us, isn't a problem at the moment); the old maxim of our “Sunday best” should still guide what we wear. N.B. : It was almost two and a half years ago that Wimbledon insisted on a dress code for spectators at tennis matches. Water jousting: A new form of water fun? I've always found an afternoon spent on a boat to be very relaxing, peaceful, and enjoyable, especially when spent with good friends and a Dr Pepper. I know what you're thinking: That looks dangerous! It does. But it also looks like it could be fun, even if the men in the image don't seem to excited! My favorite moment of the Rite of Installation of a Bishop occurs after the Papal Bull of appointment has been read and shown to the College of Consultors and after the Bishop-elect has accepted the Papal mandate. 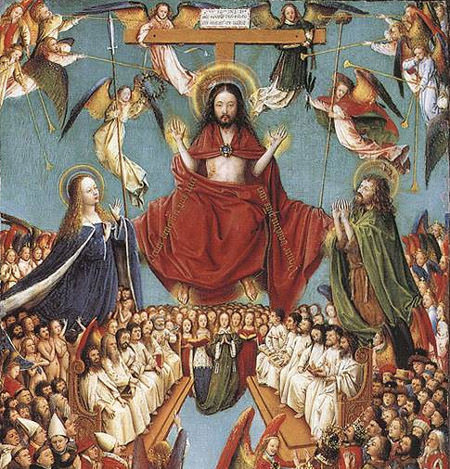 He is then led to his cathedra and seated upon it, after which he has handed his crozier. It was with some surprise, then, that I noticed that His Excellency the Most Reverend Blase J. Cupich was seated upon his cathedra a few moments ago when he was installed as the ninth Archbishop of of the Archdiocese of Chicago. 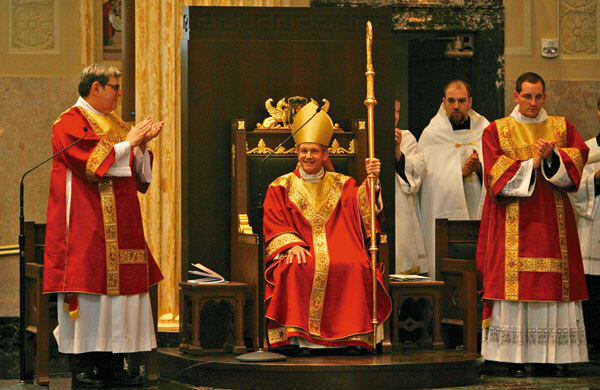 I wondered: If he did not take possession of his cathedra, was he installed as the Archbishop? A Bishop takes canonical possession of his diocese when, personally or by proxy, he shows the apostolic letter to the college of consultors, in the presence of the chancellor of the curia, who makes a record of the fact. This must take place within the diocese (canon 382 § 3). He did, then, take possession of his See, even if the prescriptions of the ritual were not closely adhered to, apparently through a miscommunication. What's the life of man, any more than a leaf? There is a certain melancholic beauty to the month of November as the leaves change their hues and fall to the ground. The colors of the ground turn to yellows, reds, and oranges, while the colors of the skies turn to grey. Soon the colors on the ground will be covered in white, as has already happened in many places. Though I dislike the autumn and see it basically as a harbinger of the death of winter, there is something moving - nostalgic, even - to the smell of fallen leavens, as anyone who has known their scent can attest. But, if we are honest, that same smell is the smell of decay, the stench of death. This month of November continually calls us to remember what we hear on Ash Wednesday: "Remember, O man, that you are dust, and to dust you shall return." Memento mori has long been the anthem of this month. Remember death. What's the life of a man, any more than a leaf? A man has his seasons, so why should we grieve? Like the leaf we must wither and soon fade away. Saint Damien of Moloka'i used to say, "We must all die ... So let us begin from this day to prepare for a happy death. Let us not lose a moment of the little time we still have to live." The angel of the Church in Sardis today says, "Be watchful and strengthen what is left, which is going to die" (Revelation 3:2). Why wait? I can't be sure, but I think this dog really wanted to meet me. Saving the best for last? Billy Boyd's "The Last Goodbye"
It was announced some weeks ago that Billy Boyd, who played Peregrin ("Pippin" Took) in Sir Peter Jackson's cinematic adaptation of J.R.R. Tolkien's The Lord of the Rings, would sing the during final credits of The Hobbit: The Battle of the Five Armies. Beginning with The Lord of the Rings: The Fellowship of the Ring, Jackson's viewers have been treated to songs which take their inspiration from each of Jackson's films about Middle-earth. Each of these songs has moved Jackson's audiences with their somewhat mystical and melancholy feel. Of each of these songs, the only one I do not particularly care for is "Gollum's Song." The song feels too whiny to me. The others, though, I enjoy very much, especially "Into the West." He impressed me very much, both with his voice and talent as a composer. Something about this song stirs my heart in ways I cannot adequately describe with words. I think Jackson and company has saved the best song for last. Are you on the roof? Do you know what's happening now? Should annulment fees be ended?